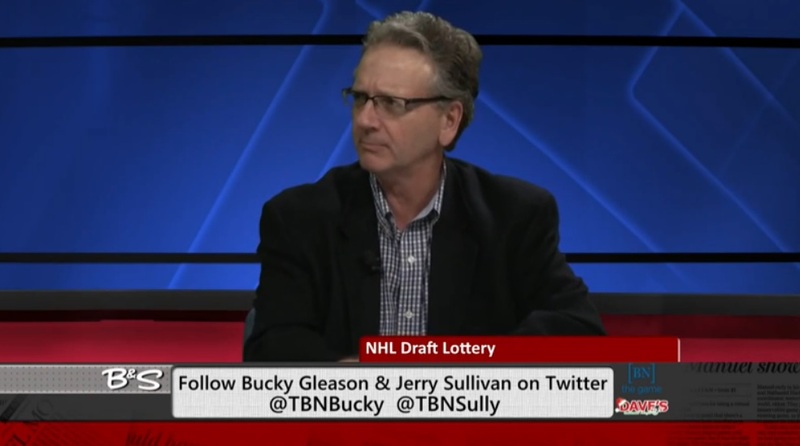 “The Bucky & Sully Show” co-host Jerry Sullivan gets irate at how Tim Murray reacted to Saturday’s NHL Draft Lottery. After praising The Buffalo News' Adam Zyglis for capturing a Pulitzer Prize, Bucky and Sully look back at the NHL Draft Lottery and discuss GM Tim Murray's reaction. Was this a major PR failure on behalf of the Sabres? Is it true that Murray doesn't value Eichel nearly as much as McDavid? Assuming the Sabres wind up with Eichel, what will the Boston Terrier star do next season? Segment 2: In the second segment, Bucky and Sully continue on the topic of the Sabres, looking back at how Murray has made big decisions in the past. Was his poor handling of the Draft Lottery just a blip on the radar? Or was he never meant to be in front of the camera in the first place, given the Pegulas plan for the Sabres' administration? Also, the follies of Edmonton are touched upon. Segment 3: Bucky and Sully unravel the Shannon Evans saga that unfolded Monday. Will the University at Buffalo basketball star really transfer to a higher conference after Hurley's departure? How does this reflect on UB athletic director Danny White? Also, Sully admits worry about his Spurs in the first round against the Clippers. Final Segment: The two hosts wrap up the show by dropping some true Hobey Baker knowledge.